I don't want to write, I want to go back to my research because I just found my ancestors who lived in Harlem New York in 1662, when it was New Amsterdam. This is a win in some family history Bingo game I am playing which has no rules and will probably never end. This isn't enough, of course, I need to find out more -- where they came from, who their neighbors were and whether they quickly left Harlem. I would rather have too much to do than ever be bored, so I am grateful for this shiny happy productive distraction. One of the biggest outcomes of my research is seeing the relentless forces pushing people around from generation to generation. Sometimes I can give the event a name (look dad! 17 of your relatives left during the French Revolution!) and sometimes I just can't (why did both of these parents die in 1698? who raised my orphan ancestor?). I can also see family size crash from 10 and 12 babies to 2 or 3 babies across the centuries, but that's for another discussion. 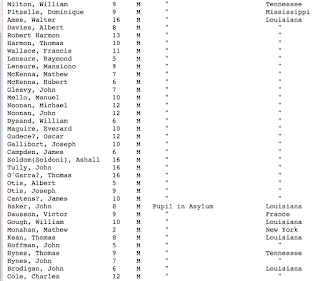 I have continued to compulsively line up rows and rows of ancestors making sure everyone has parents and grandparents and have found more than one set of cousin marriages in Colonial New England, 19th century Creole New Orleans and on the Kentucky frontier. Each time I thought I was tired, that my brain was numb and the all the names started blurring together. Each time I zoomed back and checked names and shook my head at the connection. Today's treasure is that I can officially announce that I found two ordained Reverends. This is a big deal because I always have believed our family has been Roman Catholic since the church was founded. Seeing ancestors in Colonial New England shook my certainty, and now seeing actual Baptist preachers in my family seals the deal. My favorite ancestor discovery today has been Reverend Joshua Carman who was preaching in Kentucky in the late 1790s and early 1800 and decided to kick all the slaveowners out of the church. This got him in a little trouble and it made him new friends, I'm sure. Abolition didn't become a HUGE movement until the 1830s, so this man was (in my humble fan-girl opinion) waaaaay ahead of his time. He continued to stand firm for the immediate abolition of slavery and apparently moved to Ohio and or Pennsylvania where his fervent anti-slavery, immediate emancipation preaching is more welcomed. One document claims that Joshua Carman preached to Abraham Lincoln, but I'm not to sure about that. I think my connections to the Mayflower and William Penn (which you are patiently waiting for, thank you) are more solid and possible and also interesting. Today's research showed me that one of my relatives definitely said he saw Daniel Boone's brother once. That was a moment. Yay for him. My research keeps going back to someone I'm not related to by blood, but whose story calls to me and whose name I refuse to tell you so you won't get ahead of me as the story unfolds. Let's call him him Louis Gastinel. In 1860 he was in a workhouse in New Orleans, listed as a mulatto; by 1865 he was in Law School in St Louis (how? who sent him? the church?) 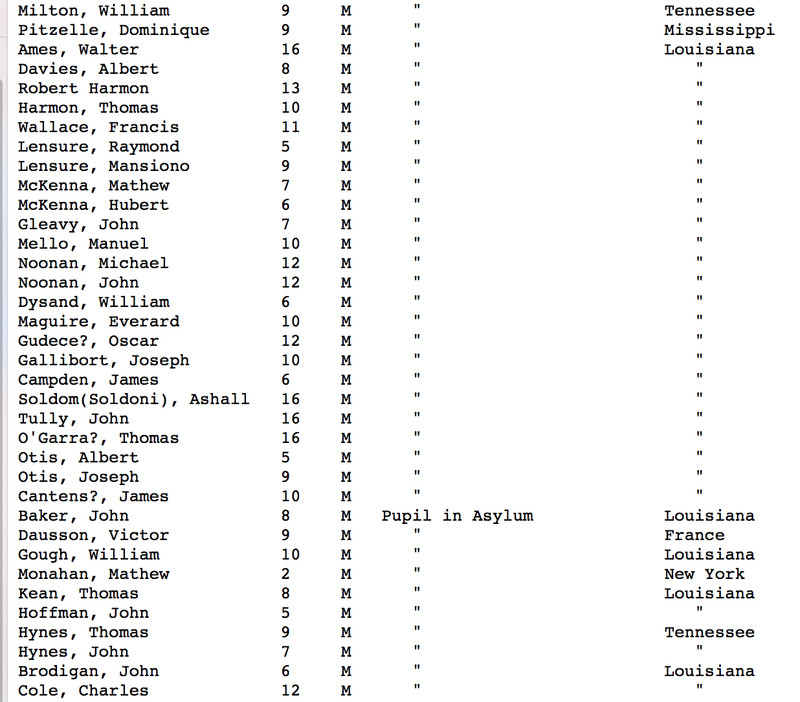 and in 1880 he listed in the New Orleans city directory is a lawyer not listed as a mulatto. 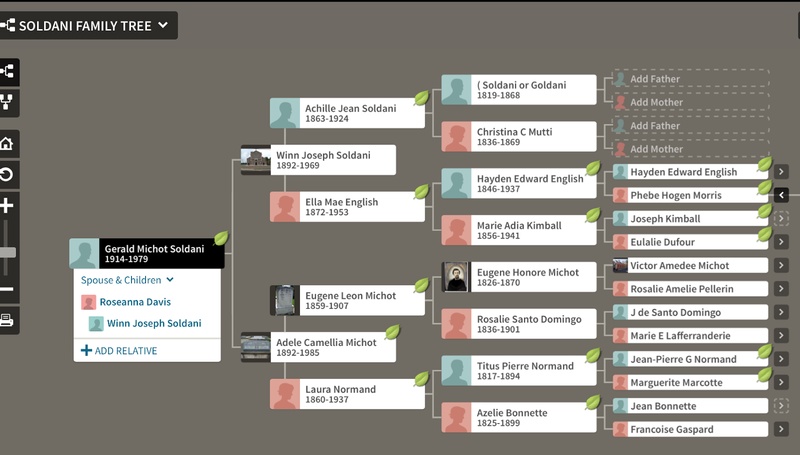 In 1890 he marries my Cuban-born, New Orleans raised 3rd great grandmother, Rosalie Elizida Santo Domingo who was widowed in 1870 and lost both of her French-born Creole parents by 1880. Rosalie and Louis were only married for two years before he dies, but I'd like to think this marriage was a huge deal for both of them because they liked and respected each other very much and the time together was some of the happiest two years of their lives. 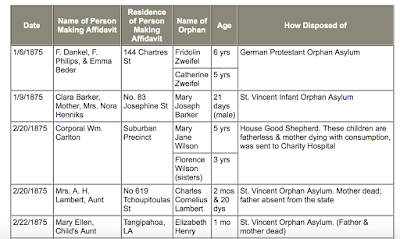 My research has also took me off of ancestry and in one of my adventures I found listings of impoverish orphans brought to the church or to the city and where they were sent (St. Mary's, St. Vincents, etc). I felt pulled read the column listing who brought the orphan/widow, and one name kept coming up, Rosalie Santo Domingo's second husband. 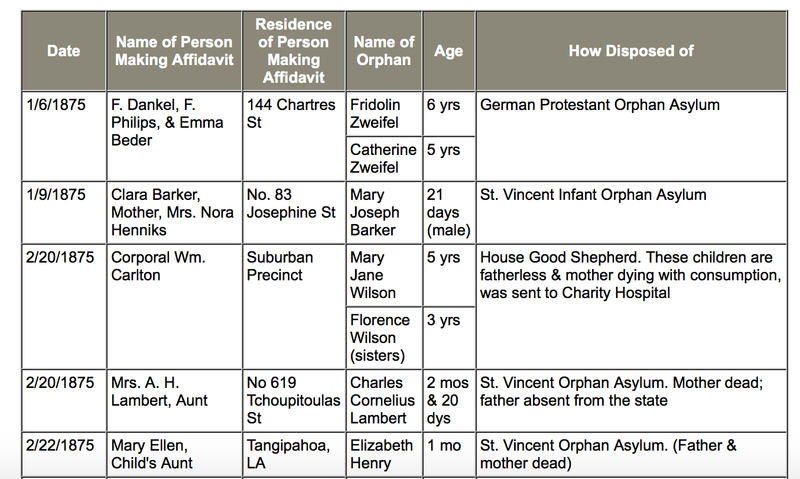 This is an example of what I found, but this screenshot doesn't show L. Gastinel bringing kids. You get the point, right? I am guessing he did this as part of his work as a lawyer and counselor, and because he was a professional this is a life path he chose. I am guessing he chose to be a man of service, a helpful good man who connected people who needed help with people who were called to help. There is a moment in 1870 that my father's ancestor Achille Soldani (spelled Achall Soldom Soldoni in 1870 archive) is listed as being at St. Mary's while Louis was a fixture, coming and going from several orphanages, giving hugs and asking kids if they're saying their prayers and brushing their teeth (because what else could he ask them? whether they want to live in an orphanage??). Rosalie Santo Domingo Michot Gastinel never met her great-grandson -- my grandfather -- Gerald Michot Soldani, but she really might have met the orphan Achille Soldani, and in my heart, they laughed together when they met.